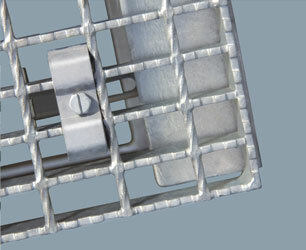 We supply gratings with our standard saddle top fixing clip. We have a team of engineering experts who will advise you on what type of clip would be most accurate and appropriate for your application. Oasis Metal is also known for designing and supplying customized clips for special applications when required. Our Grating products produced from steel and other materials are perfect for flooring solutions in different conditions because they provide a high strength to weight ratio. Our Light duty steel gratings are the ultimate match for handrail infill panels, walkways and security barriers. Gratings manufactured for heavy duty applications is the most preferred choice for flooring applications in industries that utilize forklifts, trucks, and semi-trucks. Our engineers are highly experienced in designing and fabricating gratings for access platforms, grilles, walkways, trenches and fences that are structurally sound. We provide stainless steel gratings that are built for outdoor applications, to withstand the elements of nature and those that are ideal for use even in the most corrosive environments. Oasis Metal also manufactures a line of grating products with two kinds of surface and treatment finishes – plain and serrated. A serrated finish offers the best anti-slip surface ideal for industrial applications. Our treatment finishes range across self-colored, painted or a galvanized finish. A galvanized finish is the most ideal choice for gratings that would be installed in corrosive environments as they prevent the grating from rust and other corrosive substances that might other reduce the long service life of the grating. Since we religiously follow the fact that quality is paramount, since only the best quality product and service are what always stand, our business strategies are based on providing the finest quality to ensure customer satisfaction. And this is what has enabled us to grow into a global supplier within a short period. We deliver our products to your door step or the nearest port through professional shipping agents across the Middle East with duty exemption in GCC countries and also take care of border crossing fees, documentation and clearance. We export products to 30 countries across all the continents. Fixing Clips are available in Mild Steel or Stainless Steel. Gratings can be supplied with our standard saddle top fixing clip. Our Engineering department can advise you on the correct type of clip needed for your application. We can also design and supply customized clips for special applications when required.